The National Center for Educational Statistics (2016) released a report based on the results of the 2015 School Crime Supplement to the National Crime Victimization Survey. In it, they report that 20.8% of students between the ages of 12 and 18 have experienced bullied. The most likely location of the bullying is in a hallway or stairwell. Sadly, only 64% reported being bullied. Bullying is the use of verbal or physical force to intimidate, control, or dominate another individual. In order for bullying to occur, repetition and a power imbalance must exist. Repetition refers to the idea that bullying behaviors typically are recurring or have the possibility of recurring. Power imbalance refers to the idea that bullies usually use their power in terms of physical strength or social status to harm others. Typically individuals are bullied for their physical appearance or social status. With regard to social status it may include, but is not limited to, one’s religion, gender, sexuality, socioeconomic status, and race. There is no denying that bullying is indeed a very serious issue in the United States. As educators, we strive to create a comfortable environment for all of our students to learn, interact, and succeed. Unfortunately, this environment can easily be disrupted for any student who is a victim of bullying. They may become withdrawn, distracted, or simply too afraid to even be in school. It is a shame that such horrendous acts continue to occur in educational settings, but their occurrence cannot be denied. Consequently, it is tremendously important that you learn how to identify, stop, and help those victimized by acts of bullying. 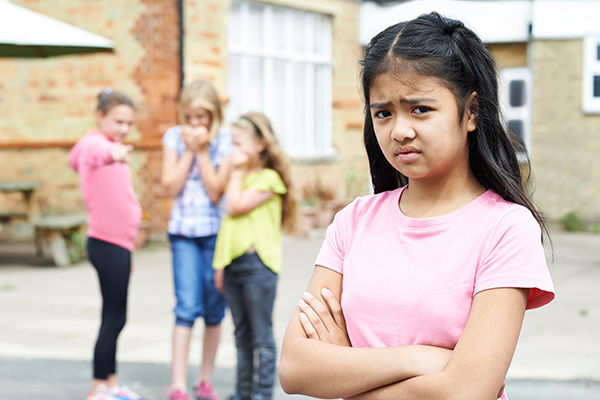 Acts of bullying may not always be as easy to spot as one student pushing another student. Many times, bullying takes on other forms. In terms of the most common types of bullying, there are four categories: verbal bullying, social bullying, physical bullying, and cyber bullying. Verbal bullying consists of teasing, taunting, name calling, threats, sexual harassment, etc. Any offensive comments targeted toward another person with regard to their religion, gender, race, sexuality, or appearance can be categorized as verbal bullying. An example of verbal bullying would be if a group of students were making fun of another student for wearing glasses. Almost half of the bullying that occurs in the United States is considered verbal. Social bullying refers to making an individual feel alienated or left out. It occurs when a person or group purposefully leaves someone out or when a student tells another student not to be friends with someone. It can be as covert as spreading rumors about someone behind their back or as direct as humiliating someone in public. An example of social bullying would be if a student were to join a group at a lunch table, but the group refuses to let him or her sit with the group. Physical bullying occurs when someone exerts pain or damage on another individual’s body or property. This type of bullying includes, pushing, hitting, kicking, pinching, spitting, etc. Regarding damaging of property, this includes breaking, ripping, cutting, etc. It can be something as simple as using body language or gestures to communicate rude remarks. An example of physical bullying is seeing a student being pushed by another student in an attempt to collect money or other valuables from them. Cyber bullying is done through such mediums as computers, cell phones, or any other electronic device that can be used to communicate with others. As technology advances, the growth in cyber bullying increases. Cyber bullying can occur through text messages, e-mails, phone calls, voice mails, Facebook, Twitter, blogs, chat rooms, and more. It is more difficult to control because it may be difficult to identify the source of such bullying. Consequently, students may find that this is a safe way for them to use aggression against others without being caught. For example, a student may create a website under a fake name that discusses another student’s promiscuity in an attempt to humiliate them and ruin their reputation. There are many ways you, as an educator, can help with the problem of bullying in schools. Preventive measures can be taken, discussions can be led, and tips can be given to students. Review the tips below for both teachers and students. For more ideas, visit the National Bullying Prevention Center website. They offer many resources for teachers, parents, and students. The first step in preventing bullying is to acknowledge it. This is a great way for both the bullied and the bullies to know that you are aware there is a problem. Sometimes victims of bullying may feel like they’re alone or that their experiences are not worthy of attention. Bringing the topic of bullying out in the open helps students understand there is someone there to help them. Once you have acknowledged the problem of bullying, keep an open door policy. Be sure students understand that you are always there if they need you. Promote a friendly and welcoming atmosphere within your classroom. Bullying is usually targeted at those who are unique in some way. This may make some students feel ashamed of who they are. Advocate for their unique differences and cultural backgrounds by incorporating activities in your classroom that put those characteristics in a positive light. Perhaps you may ask students to do a show-and-tell on an item that represents their culture or create a poster on an influential figure of their ethnicity. Assigning these types of activities makes students feel proud of their backgrounds and excited to show off their unique characteristics. As with any behavior you teach students, you must be a role model for anti-bullying behaviors. This means showing all of your students, fellow teachers, and staff members, kindness and respect. Never belittle, tease, or put down another person, especially in front of your students. Remember, your actions speak louder than your words. Discuss the tips below with students regarding how to deal with bullying. Ignore the bully and walk away – Walking away is not a sign of weakness but, rather, a sign of strength. Bullies love getting a reaction out of their victims so you should not give them the satisfaction. Simply walk away while keeping your head high as to not show vulnerability. Control your anger – Bullying is a way for another person to try and control you and your emotions. Do not let them get the best of you by getting upset. Instead, use other outlets for your emotions such as writing or exercise. Getting physical is not the answer – Don’t respond to bullying by getting physical. Doing so will likely get you in trouble and lead to more aggression from the bully. Instead, find other ways to be assertive or just walk away. Violence is never the answer. Be confident – Be proud of who you are. Embrace all of the unique characteristics about yourself and find contentment in your own identity. Once you have practiced feeling good about yourself, practice how you would react to bullying in nonviolent ways. Make sure you always show confidence in yourself. Communication is key – Talk to people you trust and those that care about you. These individuals may include a guidance counselor, family member, friends, and your teacher(s). Allow them to give you advice and support you. Surround yourself with good friends – Find friends that like you for who you are. True friends will provide you with a support system that will help you through any tough situation, including bullying. Connie Ryan is a former elementary school teacher. She has also traveled across the country providing live training sessions to thousands of educators. In 1997, Connie started the Professional Development Institute to provide busy educators with a convenient, practical, and affordable training option conducted entirely online. 20 years later, PDI offers teachers over 90 online courses all of which are available for graduate-level credit through University of California San Diego. In her free time, Connie enjoys cooking, being outdoors, and spending time with her family. The Professional Development Institute (PDI) offers two online courses that focus on bullying. You can receive graduate-level credit from UCSD for each of these courses. Use the links below to find out more. Use code TCR to save 10% on each of these courses in addition to any other promotion PDI is currently running.